Here is a strategy I've been working on. I have a business where I design products and have them mass produced in China. I ordered over $200k in wholesale orders last year, so I am very familiar with the whole China production and import business. I was looking into some business models where I can marry my China import skills with real estate. I came up with buying kit homes produced in China and putting them in people's backyards. These homes are semi pre built and fold together to fit into a shipping container. They come with plumbing and electrical already built into the home. They can be made with any finishing you'd like and can be designed to meet local standards. 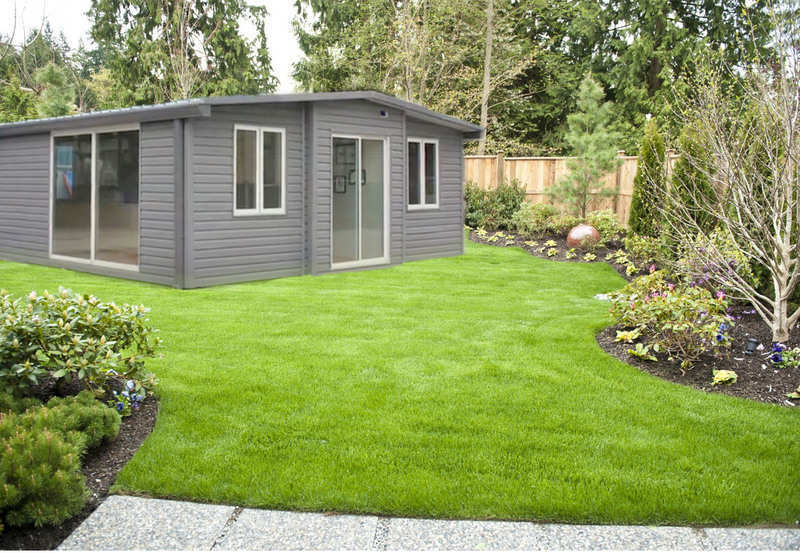 There are several sizes, but I would go after a model that is 380 sqft. It includes a full kitchen, full bath, and a small bedroom. There are new regulations in California that allow tiny homes to be placed in backyards very easily. These homes are called auxillary dwelling units (ADU). You can read more about those rules here. If the unit is under 500 sqft, meeting fire code, and a few other small requirements, it should be very easy to build these homes. I can produce these homes for $11k each. It costs about $4k to ship them. I figured I would add another $5k in costs to transport the home to the end customer and assemble it onsite. That is a total cost of $20k/home. A home this size in San Diego, CA rents for at least $1,200. I verified people would be willing to live in a space like this by making a Craigslist ad. 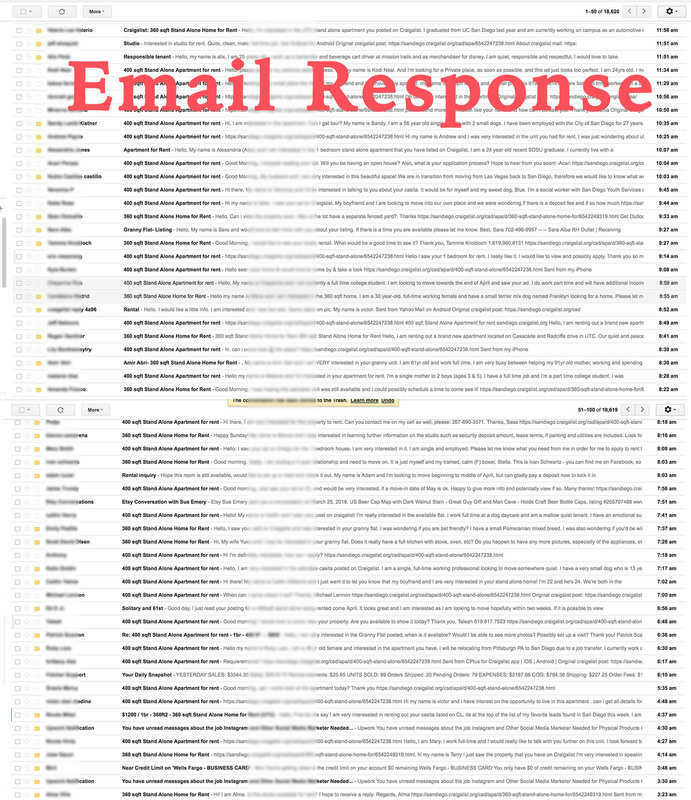 I got over 100 responses in under 24hrs (see the screenshot) so the demand is real! A unit that rents for that much should be worth about $150k, right? I figured I could charge $40k-$60k to do the whole thing for the end customer. That's a $100k value proposition to the customer. And I would make $20k-$40k on each sale. I have already talked to several people who are willing to buy my first sample home. I just need to do all the work to get them this home. Right now I need help finding a contractor that could help me oversee this project and a permitting people to help navigate the whole process. BP forum, please poke holes in my business plan! Or give me some advice on where to go next. If you have an issue with a tenant and you are not zoned to have a legal rental, you will not be able to evict them with the assistance of law enforcement. This means the only way to get rid of a bad tenant is paying them to leave. With these types of rentals its best to opt for short term or rent to a friend or family. Also, the math is a little funky. Its not really a 100k bump for the customer. You might get $1200 a month in rent(14,400 a year), but you cannot apply a standard GRM or CAP rate at the point of sale. The banks won't underwrite the income or the square footage. I'm guessing these will be installed into single family homes. If you were to ask an appraiser, they would value these at a flat rate that mother-in-law/pool house/guest houses would be valued. They would not value it by the amount of income or the added square footage. Last time I checked, the appraised value for one of these in the state of California was $25,000 and thats when the thing is permitted. Your value based on a 16x GRM at $1200 a month in California is $230,040. Your Value based on 380sq ft at $500 a sq ft would be $190,000. Your value based on a California licensed appraiser would be around $25,000. So the thru value for a buyer is somewhere between the bank's number and the value of the rental income for the owner. Other than that, it looks like you have a nice little niche product. I think for a new investor that is house hacking, or someone who owns a 3/4 unit with the land to install one of these, you have a really interesting product. @Andrew Erickson I thought about where to go next. You need to find a lender that is willing to lend on these units. That way you won't restrict your market to all cash buyers. You could also learn the HELOC process and develop relationships with banks so that when you have customers, you can streamline the process for them. Your goal is to reduce the amount of work your customer has to do to get this up and running and make the upfront cost as low as possible. @Jackson Wu , these would be completely legal granny flats that can be rented out. California likes the term ADU since it implies it has a kitchen, bathroom, and independent entrance. As long as you have those and other basic construction requirements they can be rented out. The only catch is it cannot be sold separately and the owner must occupy one of the homes. I came up with that $150k number by the rent income: $1,200/mo * 12 mo * 90% occupancy / 8% cap rate = $162k. I rounded down since it has extra restrictions that devalue the property. Even if it is worth $100k, it is still a good deal for the customer! Yes, I totally agree it would be great to find finance options for people. A HELOC should be easy to do, but having other options would be great too. This is within reach of a 401k loan too. $60k loan paid off at $1,200/mo would take less than 5 years to pay off! @Andrew Erickson Will you be doing this only in California? @Andrew Erickson If this thing scales, you could talk with lenders that specialize in the mobile home space. If you get a lender on board then you just connect them to your buyers and you have your machine up and running. Also, I just read your updated ADU rules. It looks like according to the new rules, you can have law enforcement step in and help you with evictions. I like that you are using an 8% cap. Its a nice conservative number. But you still have to factor in other maintenance costs, insurance, utilities, and repairs. Since the owner would be paying for electricity, I would consider looking into adding a solar option for certain buyers. That additional big ticket item might be price prohibitive for people trying to enter the market, but on a spreadsheet it would pencil out to an additional $1200 a month in net income. This is a great product to push in any high rent low cap rate markets: San Diego, LA, SF, Seattle. @Mike Reynolds , No, I hope to expand outside of California. I just want to start where I live because that seems easier than trying to identify markets and regulation in other states. @Ron Drake , the new ADU regulations state that the city must provide the water, sewer, and electrical hookups to your unit (at a cost). The ADU needs the same fire protection as the main home. Most homes do not have sprinklers, so most ADUs would not need sprinklers. They are treated very similar to bathroom and bedroom additions. The new bill is supposed to make ADU very easy to get permitted. @Mike Reynolds, No, I hope to expand outside of California. I just want to start where I live because that seems easier than trying to identify markets and regulation in other states. Let me know if you plan to head this way. @Andrew Erickson This is a pretty cool idea. Reminds me of someone I heard on a podcast, she built homes out of shipping containers. @Jackson Wu , Yes, valuing these properties is tricky. If you use the San Diego median home price of $366/sqft (according to Zillow) you would get 380sqft*$366/sqft=$140k. Median listing price is $468 which gives you a value of $178k. You could charge a premium since this is a stand alone unit. Usually studios rent for more per sqft than large multi room homes. But then you would have to discount it since you have to find someone who wants tenants in their backyard. Whatever the price is, buying at $50k is still a great deal! would they get "craned" into back yards? or unfolded onsite? What about foundations? do they have steel ibeams underneath like a mobile home? Owners absorb cost of hooking up sewer/electric?. Last i checked it runs around $15k to transport and build foundations/ strapping for a mobile home, then steps or an entry deck. @ $60k that is $157 a square foot! are you sure stuff like that can't be built on site for less? I can put up a whole house, septic, driveway, porches, garage etc for $90 a s.f. liveable around here. Would you stock them and sell inventory or special order? If special order, i could build one and be living in it by the time it arrives from china, no? I would love to see one. Did you spec it out as 2x4 construction or is it more like an rv? Park model rv's run around $60k i think. Don't give up! @Grant Rothenburger , Yes I looked into container homes too. They are actually more expensive and smaller than these kit homes I'm looking at. The ADU regulations (which vary in significant detail on a city-by-city basis) in San Diego compel the City to allow the use of the existing water and sewer services, but the costs for the homeowner to extend them to the ADU are on the homeowner. In terms of poking holes, you're missing the horizontal costs. $5k isn't close to realistic. By the time you add up grading, foundation, sewer (with fall), water, low voltage, and access-related changes, I would expect something on the order of $20k in horizontal costs for a typical flat 5000sf lot to drop one of these in the backyard. Add on potential electrical main panel upgrades to handle the increased load (assuming no gas service, they'll be cooking and heating with electricity in the ADU), along with drawing and permit fees and you're maybe another $5k. At scale you could maybe shave a couple thousand off, but end of day this is still site-specific construction prep. In terms of a business plan, $25k horizontal + $25k vertical and sell to the homeowner for $100k installed is still a solid value proposition for both parties. Ask the guys trying to sell solar panels (which by all accounts is an accretive investment for just about anyone) about the challenges they have - you'll have the same ones, except at a 10x price point. The other main challenge is build quality. Spend some time looking at how mobile homes are built, then compare that to a site-built (or modular) home. Big difference. At $11k, no way you're getting site-built quality. Upon resale, the additional square footage will probably be treated more like personal property that additional living space. You'll need to get quality up while keeping price in check. All this said, I'd buy one for any rental property I own, assuming quality is closer to CBC quality than shed quality. For people looking solely at generating additional income from property they own, this could make a ton of sense if you were able to execute on it. @Andrew Erickson I'm wondering what code you can have these built by. Can you do Miami Dade hurricane code? Galveston county recently adopted a close facsimile to these after Hurricane Ike. Yes, those are great issues to address! The unit would need an 8ft passageway to be moved into place with a forklift device. If 8' isn't doable, it would be very difficult to get it into place. The ADU is constructed to be placed on piers. I photoshopped them out of that photo I posted. It can be placed on a cement slab too. Sewer and electrical are connected just like a bathroom extension. I will have to research how much this might cost. $60k would hopefully be the entire cost of the construction project including permitting ($10k in San Diego) and hookups. Average cost of construction for SFH in San Diego is $150/sqft. I'm not sure that number applies to homes this small though. Sales can be done as an in-stock inventory model or custom order deal. Both have pros and cons. I would have to market test before I commit to either model. I would start with a pre sale model though since it is less risk. I will call a few construction companies and see what they would charge for a custom stick built house and see how comparable it is. @Justin R. , thanks for the feedback! I will have to do more research into prepping the backyard for a unit. That blows my mind that prepping a yard for a ADU would cost over $20k! Yes, these units can only have electrical appliances on 110V. No gas or 220V appliances. I'm sure an electric stove and fridge would need special electrical. $100k install cost doesn't sound bad too with everything included. I will have to do more research into the quality issues. One issue you would have with improving your rental properties is the new reg says you have to be owner occupied to get an ADU permitted. If you are allowed up to 500 square feet, not sure why you are at 380. Add an extra bedroom, which should be cheap. Extra bedroom adds extra income. My buddies experience with Chinese build quality has been horrible. If you get about a dozen to the US and they are installing fine and everything is working, I'd consider getting one for a place in Michigan. Ann Arbor allows ADUs. @Dave Homyak , the basic model is designed to be 380 sqft. I'd have to do a lot of modifications to get it to 500 sqft. Might be worth it though. @Grant Rothenburger, Yes I looked into container homes too. They are actually more expensive and smaller than these kit homes I'm looking at. As others have, I would imagine the on-site construction costs would be a little higher: concrete slab, utilities, surveying, etc. Then of course, depending on where the site is. If in the California Coastal Zone, there are additional regulations/requirements - even for ADUs. One would still need to calculate their specific property's zoning and FAR (floor area ratio) to insure the ADU doesn't violate any setback and other restrictions. But that's on the homeowner. This sounds like a decent business plan...assuming these kits meet the current CA dwelling codes for everything from fire to earthquake. Question; have you done a side-by-side comparison for the true costs of this vs. domestic modular home builders? I would filter it down to price/sq ft. I suspect that a domestic kit builder (including mobile homes) would be a bit cheaper by avoiding the freight, import fees, etc. Don't forget about Trump's soon-to-accelerate trade war with China! That is certainly a threat you shouldn't ignore! Otherwise, great idea. I'd like to follow to see how you progress and if you can turn this into a reality. Great concept if you can put together the systems to make it a profitable reality. I researched adding an ADU to a rental property I had in Oceanside, but at the end, although it would have made extra income on the rental side, it would have taken too long to recoup my expenses when I sold it because it just didn't add enough value to the SFH from an Appraiser's point-of-view. view. Of course I was planning on Stick building it and not importing it from China, which could be a whole other ballgame. There is a contractor here in San Diego that specializes in ADUs. Maybe on BiggerPockets, I don't remember . You should connect with them. I'm sure they could help you navigate all the different regulations of all the different cities. As mentioned earlier, each city has its own regulations. Some, like Oceanside, have just adjusted an approved their new guidelines to fall in line with the new state guidelines, others are still in the progress. @Anthony Ciulla , I was hoping to keep all of those costs to a bare minimum. Sounds like that is wishful thinking though. I doubt anyone in the coastal zone will want one of these homes. I don't think there are many yards that aren't already optimized near the coast. The regs say you have to have the same fire protection as the main home, so sprinklers are not required on most homes. I talked to the city today. They said I would be regulated by the State department of development. Looks like I'll have to read through regs and talk to them now. I certainly need to get a side by side comparison to domestic production and stick built homes. I doubt they beat China prices though. The freight is crazy cheap. Only $3k-$5k from factory to backyard. I've never been too worried about international trade restrictions. I've been paying tariffs for years. They are so small it is a rounding error on my P&L. Hopefully, that doesn't change.